For the past few years, the businesses of Fairhaven district have hosted a Girls Night Out. Filled with fun activities and store specials, this ladies night is a fundraiser for cancer reasearch, with all proceeds going to St. Joseph Hospital. This year, Girls Night Out falls on Thursday, May 6th, 4PM-10PM. Various businesses will be selling pink passports for $10; passports include raffle tickets for the door prizes available at participating stores. Passports will also allow admission to the Girls Night Out festivities, including a comedy show, fashion show, and bachelor auction! Participating stores will stamp your passport, and if you receive 7 stamps, you can turn your passport in for the chance to win an overnight stay at the Fairhaven Village Inn and a $50 gift certificate to Mambo Italiano. More information about Girls Night Out can be found at http://www.girlsnightoutfairhaven.com/. The Bead Bazaar is a proud participant of Girls Night Out, and in support we will be giving free demonstrations on earring making techniques. 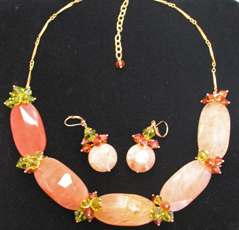 A staff-made set of necklace and earrings, rich with warm peachy agate and Swarovski crystals, will be featured in the Girls Night Out Fashion Show. We will also be raffling off a staff-made necklace and earring set featuring our gorgeous Genie Beads, valued at $45. Be sure to drop some raffle tickets off for the chance to win beautiful jewelry and support a good cause! As of April 28th, we at the Bead Bazaar have been able to raise $245 after selling over 20 pieces of Tibetan silver!!!!! We thank all of our participating customers for their contributions, and encourage everyone to join in the efforts to provide earthquake relief to Jyekundo. Thank you everybody! On the morning of April 14, an earthquake measuring 6.9 hit Jyekundo, an area in the present-day Chinese Qinghai Province that is 98% Tibetan. Recent reports estimate that 1,400 are dead and more than 10,000 injured. Earthquake damage caused most of the buildings in the town of Jyekundo to collapse, including schools, and some monasteries suffered extensive damage. More information about the quake can be found here. In an effort to aid with earthquake relief, the Bead Bazaar will be donating 100% of proceeds from the sales of Tibetan silver beads and pendants to the Jyekundo Disaster Relief Fund through the end of April. We invite you to join us in our efforts. Beautiful, Artistic Ceramics from Washington State! 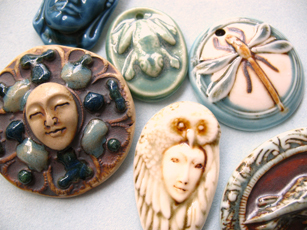 New giveaway~ a free ceramic bead with every $20 purchase! The Bellingham Bead Bazaar is proud to introduce a new line of gorgeous ceramic pieces, and to celebrate our new collection, we are giving away a free bead with every purchase that comes to $20 or over! One per customer, please. Rich with earthen hues, these lovely clay pieces are handcrafted by artist Jean Christen in eastern Washington. Jean has been a potter for 40 years, using her own reduction glaze mixes. A technique developed in China, reduction glazes force the oxygen out of the clay itself, producing the glittery effect of the glaze. Colors are not always predictable, as temperature variations can produce dramatically different and unique effects. Liquefied glazes running and blending with each other can also created one-of-a-kind color combinations. The green and blue hues of Genie Beads add a touch of elegance to nature, while this unique finish process leaves each bead with a combination of polished color and rough earthen ceramic. Amongst the bright colors, Jean gives brown its own beauty in emulating the look of tiger eye. Genie Beads are well complimented with a selection of pendants, graced with the images of butterflies, turtles, and dragonflies and all set on filigree backgrounds. 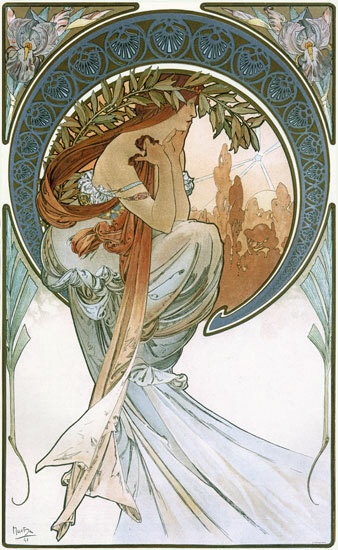 One particular design, a raven over a filigree crescent moon, is especially reminiscent of Art Nouveau Czech artist Alphonse Mucha. Other Genie Beads images include a variety of feminine faces, framed by leaves or crowned with animalistic head dresses. Because of Jean’s finishing process, each piece has a unique mixture of colors, leaving not two identical. 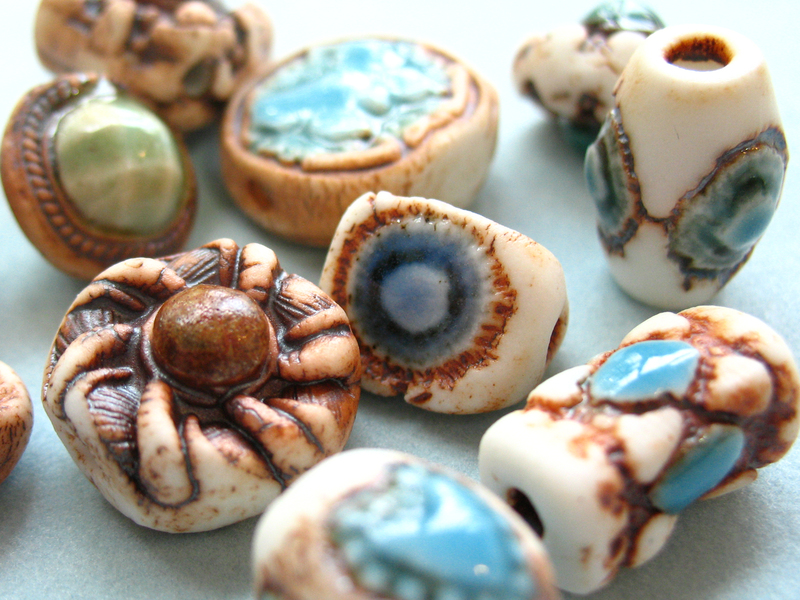 These beads and pendants are hi-fired and vitrified, making them tough and durable like stone. That coupled with their beauty gives many years of enjoyment to the wearer. Most inspiring is the fact that such creativity came from a local artist. We at the Bead Bazaar are proud to see what can be created by the people of Washington, and invite you to come take in the beauty found in our own state- you are sure to be pleased! Keys. Gears. Locks. Cogs. The images of industry, mechanics, and clockwork all invoke the essence of Steampunk. But what exactly is it? 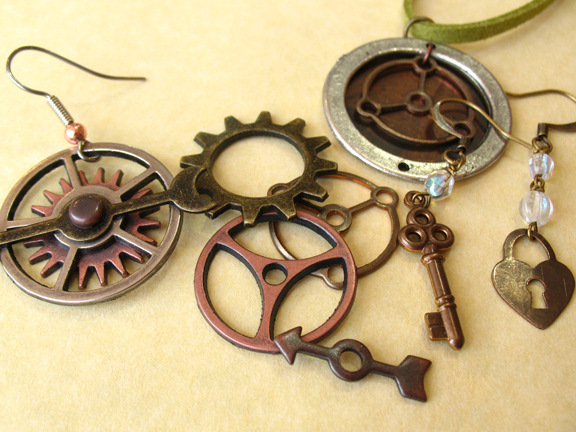 Steampunk findings of gears, cogs, locks and keys. Simply put, Steampunk is the term used to refer to an alternative era, and as the name suggests, steam is the central focus. During industrialisation and the Victorian era, many power sources were used and explored: gas, electricity, coal. As we all know today, natural gas, fossil fuels, and electricity are our main power supply. Steam power is essentially an obsolete energy source, despite its prominent use in history. (steam locomotive, anyone?) The theoretical Steampunk era is a re-examination of the Victorian era, based on one question: what if steam had become our main power source? What if modern inventions ran on steam-based and clockwork technology, rather than electronically? Such lines of thought were fueled by the inventions of science fiction writer, Jules Verne. The resulting alternate reality became known as Steampunk. 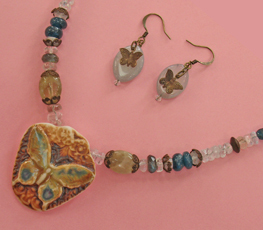 Combined findings to make earrings and a necklace. 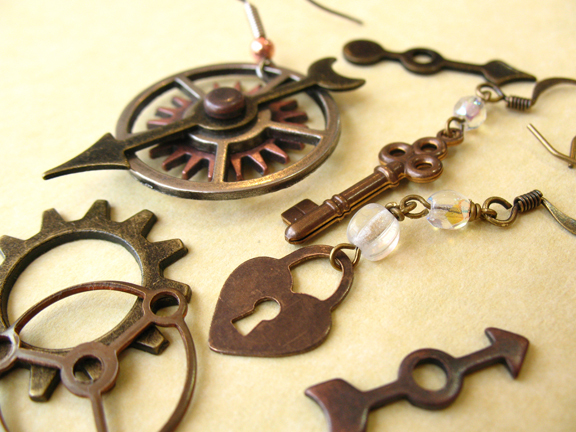 Because of this industrial base, Steampunk imagery is riddled with various mechanic and clock-work items; gears, clock faces, and watch-parts are among the most popular components in Steampunk jewelry. The skeleton key is a universal icon of times past, and thus common in this jewelry style. Not forgetting Steampunk’s origins in the Victorian era, the edgy industrial components are often balanced with more traditional Victorian filigree. Victorian influences abound in Steampunk fashion, featuring bustles, top-hats, and corsets. The antique, earthy tones of the pendants and filigree from Vintaj make them ideal for Steampunk jewelry, counterbalancing the rustic with the delicate. We have also recently received a shipment of various decorative cogs, gears, and spinners, which can be assembled to created compass-like contraptions. Whatever your inspiration, the loose boundaries of Steampunk allow for tremendous creative freedom. Come stretch your imagination and become inspired by the possibilities!